Hawaii's first Alternate Port Concept exercise was held at Pearl Harbor Friday morning. This alternative will allow Honolulu ports to receive consumer goods, should Honolulu Harbor close due to disasters and other emergencies. "Ninety-eight percent of those goods come in through the island of Oahu," said Capt. Shannon Gilreath, Commander of the Honolulu Coast Guard. "And so, if we were to lose that port, that's not just going to be devastating for Oahu, but for the entire state." An important part of the Alternate Port Concept is a $3 million mobile crane that was delivered in October of 2014. Although it will not cover the full potential of Honolulu Harbor, the crane will allow the state to receive 15 to 20 percent of shipped goods. Received through a Port Security Grant from the Department of Homeland Security, the crane allows shipping companies, such as Young Brothers and Matson, easy access during emergency unloading. The crane was specifically created in order to unload trans-oceanic vessels and can carry up to 350 tons at a time using a 260-foot extended boom. 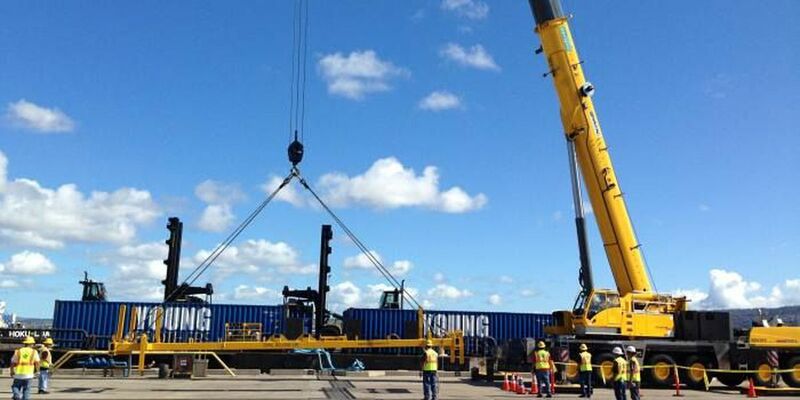 Should the need arrive, the crane can also be shipped to outer islands. Hawaii is the first state in the nation to use this kind of system to alleviate the flow of consumer goods during emergencies. During today's exercise, representatives from the Philippines, Guam and Indonesia were present in hopes of taking the idea back to their homeland. "We do have a number of foreign dignitaries this afternoon," said Captain Stanley Keeve of the United States Navy. "And they are looking at this concept for their particular infrastructure." Besides taking in shipments, the Alternate Port Concept will also give local workers employment after disaster strikes. "Our intent is to turn this mission to the folks that do it best," said Captain Rob Espinoza, Emergency Liaison Officer for the U.S. Navy. "And that's here with the local industry." The concept is part of an eight day drill, which started on June 1. This is the State's largest disaster-preparation exercise, with 2,200 participants and spans across four islands. It will prepare the Coast Guard in case of medical mass casualties, disease outbreaks, natural disasters and more.